SMLA-1 single setpoint and SMLA-2 dual setpoint limit alarms offer flexible, wide-ranging DC input capability. Voltage spans from 10 mV to 200V and current spans from 1 mA to 100 mA can be field configured. Bipolar inputs are also accepted. Both models offer configurable latching, failsafe and HI/LO operation. The SMLA-1 and SMLA-2 also include 0.25% to 50% adjustable deadbands and selectable 120/240 Vac input power. Models SMLA-1 and SMLA-2 are equipped with a dual function diagnostic LED. The green center LED indicates line power and input signal status. Active line power is indicated by an illuminated LED. If the center LED is off, check line power and the wiring connection. If the input signal is above 100% full scale, the LED will flash at approximately 8 Hz. Below 0%, the flash rate is approximately 4 Hz. The single setpoint SMLA-1 and the dual setpoint SMLA-2 provide the following relay outputs: SMLA-1 Single Trip (DPDT, 5A); SMLA-2 Single/Dual Trip (2 SPDT, 5A). 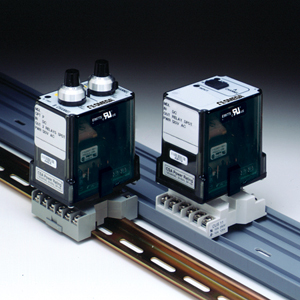 Setpoints are top accessed multi-turn potentiometers. The field configurable SMLA-1 and SMLA-2 limit alarm setpoints can be configured for HI, LO, latching or failsafe trip operation. Non-latching HI and LO setpoints have respective HI and LO deadbands. In a tripped condition, the setpoint is exceeded and the appropriate red LED will illuminate. The trip will reset only when the process falls below the HI deadband or rises above the LO deadband. To reset a latched setpoint the signal must be in the safe region and the line power turned off for at least 5 seconds. For proper deadband operation, a HI setpoint must always be set above a LO setpoint. In failsafe operation, the relay is energized when the process is below the HI setpoint or above the LO setpoint (opposite for nonfailsafe). In the failsafe mode, the relays go to the tripped condition when the power fails. The input must remain beyond the setpoint for 100 milliseconds, uninterrupted, to qualify as a valid trip condition. Likewise, the input must fall outside the deadband and remain there for 100 milliseconds to return the alarm to an untripped condition. This effectively results in a “dynamic deadband” - based on time - in addition to the normal deadband. Note: Comes complete with operator’s manual.